CNG: Printed Auction Triton XII. INDIA, Kushan Empire. Vasishka. Circa AD 240-250. AV Dinar (7.81 g, 12h). Mint E. 2nd emission. Sale: Triton XII, Lot: 446. Estimate $2000. 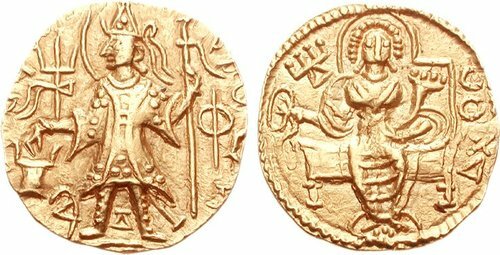 INDIA, Kushan Empire. Vasishka. Circa AD 240-250. AV Dinar (7.81 g, 12h). Mint E. 2nd emission. [ÞAONANOÞAO BAZH]ÞKO K[O]ÞA[NO], Vasishka, nimbate, diademed, and crowned, standing facing, head left, sacrificing over altar to left, holding trident in left hand; filleted trident to left; “Vira” in Brahmi to inner left at feet; “Va” in Brahmi between legs; “Chhu” in Brahmi in inner right field / ΔXOO up right field, nimbate and diademed Ardoxsho seated facing on throne, feet holding filleted investiture garland in right hand and cradling cornucopia in left arm; above, tamgha to left. Cf. MK 567/569 (O1/R60 [unlisted die combination]); Donum Burns -. EF. Unpublished reverse for this ruler.